Warden Dan Dufault sets the Cessna down in a surprisingly good place to land a plane. 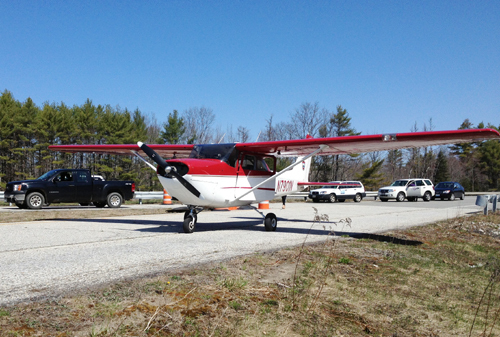 LITCHFIELD — Soaring over treetops and touching down on the Maine Turnpike with few cars in sight, a Cessna plane piloted by a game warden appeared unscathed after its engine died Friday morning during a planned survey of eagle nests. A few startled drivers apparently suffered the only collateral damage when the plane made an emergency landing on Interstate 95. 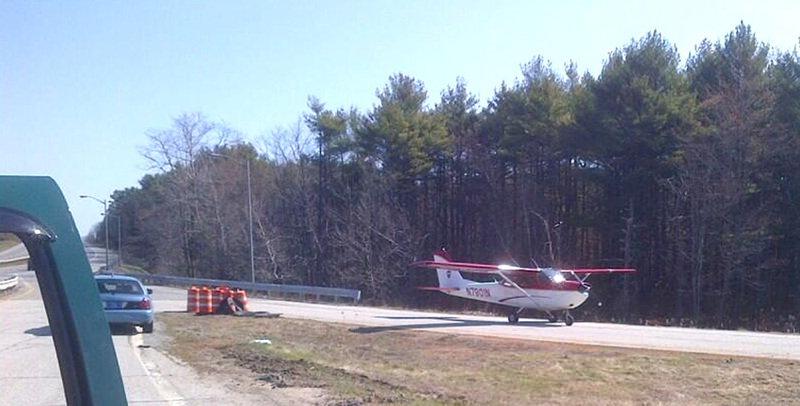 The Maine Turnpike tweeted this photo of the scene Friday morning. No one was injured during the landing, which occurred about 8:50 a.m. on the northbound lanes of I-95 near an old rest area at mile marker 98. The single-propeller plane had taken off about 35 minutes earlier from Belfast Municipal Airport. Its destination was the Auburn/Lewiston Municipal Airport. The plane, a 1968 Cessna 172, remained parked in the rest area parking lot for about 2.5 hours before it was refueled and flown to the nearby Augusta State Airport. Game warden Dan Dufault piloted the aircraft and was accompanied by passenger Charlie Todd, a biologist with the state Department of Inland Fisheries & Wildlife. Durward Humphrey, the chief pilot for the warden service, said the plane suffered a mechanical problem that has not been identified yet, killing its engine power. He said the plane would be inspected before returning to service. A Maine Turnpike Authority traffic alert initially reported Friday morning that the plane had landed because of an empty fuel tank, and Sgt. Jason Luce of the Maine Warden Service also initially said that the plane had “a fuel issue.” But Humphrey disputed those reports and suggested the plane’s top trouble was mechanical. “The extent of damage to the aircraft, if any, has not been determined yet,” FAA officials wrote. Dufault would not comment on the incident while he was at the landing scene. 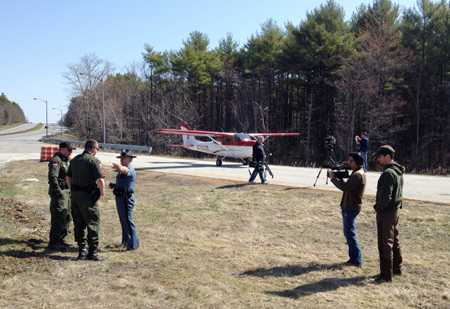 Shortly before the plane took off from the highway, wardens directed news media members to the far end of the rest area parking lot before positioning their trucks — and a sport-utility vehicle being used by a film crew for the Animal Planet series “North Woods Law” — in front of the plane, blocking the news gatherers’ view. Wardens still could be seen dumping several containers of fuel into the tank spouts, which were atop the plane’s wings. Moments later, Maine State Police troopers closed both of the highway’s northbound lanes. The plane taxied about a quarter-mile south, turned and sped north before lifting off into the clear blue sky and disappearing from view. Humphrey piloted the plane to the Augusta airport. “In my 16 years, it’s the first time they’ve landed a plane on the interstate,” Maine State Police Trooper Lee Vanadestine said at the scene. Dan Morin, spokesman for the Maine Turnpike Authority, said the interstate — at least in the Litchfield area — is a surprisingly good spot to land a plane. It’s about a 10-minute drive on the highway south of Augusta and 20 minutes north of Lewiston, and most northbound traffic takes the more direct route of Interstate 295 instead of the turnpike. Andy Perry, a highway supervisor with the Maine Turnpike Authority who stopped at the rest area Friday morning, said the only other plane he could recall landing on the interstate did so about 30 years ago in the Gray area. “It doesn’t happen very often,” Perry said. 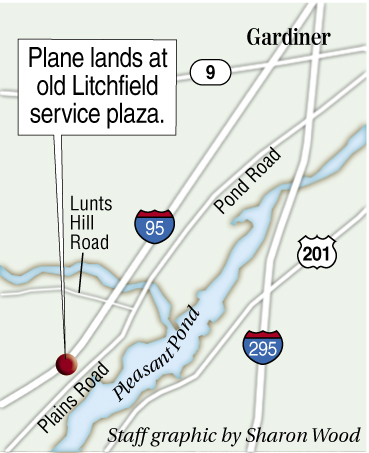 Randy Greenleaf, who lives on nearby Plains Road in Litchfield — just a few minutes’ walk from the old rest area — said he was examining his model airplane in his driveway when he heard the warden’s plane in distress. Greenleaf said he called 911 and ran toward the rest area, expecting to find a plane in pieces. What he found instead was a plane on its wheels and Dufault and Todd walking beside it. “They didn’t have much to say when I got here,” Greenleaf said. Todd, the state biologist, said he and Dufault had been planning to conduct a survey of eagle’s nests when the plane’s troubles disrupted the flight. Sandy Reynolds, fixed-based operator for the Belfast airport and president of Maine Scenic Airways, recalled briefly chatting with Todd in the airport lobby before the flight took off Friday morning. Reynolds, who confirmed the airport provides refueling services, said a variety of problems can lead to false fuel readings, including a gauge that indicates more fuel than actually exists. He said the pilot alone is responsible for checking fuel levels before takeoff, not the airport staff. Reynolds said he tells his flight students to consider area roads and highways if they are forced to make an emergency landing. Reynolds said he has flown planes since 1967 — about 21,000 hours — without experiencing a total engine stop. Dufault, who is based at Turner Aviation Field, joined the warden service in 2003. A news release at the time indicated he had received his pilot’s license when he was 16 and flown for Currier’s Air Service in Greenville before joining the warden service. Dufault also spent more than four years as a bush pilot flying for two sporting lodges in Alaska before returning to Maine. Luce said Dufault skillfully maneuvered the plane in front of a tractor-trailer while landing to help slow northbound traffic. “I’d get in the plane with him right now,” Luce said. A licensed aviation mechanic, Dufault was one of three warden service pilots to spend a total of about 500 hours refurbishing the Cessna 172 after it was given to the state in 2007. The four-seat plane, which was an Air Force surplus, received a number of upgrades, including a new engine. Officials said at the time it was put into service in 2010 and that the plane could stay in the air for hours and be anywhere in the state within two hours. Humphrey, who has been a pilot since 1985, including a stint as an Alaskan bush pilot, has flown for the warden service for more than 20 years. He said he has experienced problems that forced him to land the plane. “You hope you’re in a good spot,” he said.